You can read these texts using the Oremus Bible Browser. Did you hear that the Pope came to visit the US last week? The media coverage was filled with pictures of Pope Francis blessing, kissing, teasing, laughing with and talking to children. He genuinely seems to enjoy and treasure children. In an interview on the plane back to Rome he said that his earlier (9/8) “streamlining” of the annulment process was not intended to “open the door” to Catholic divorce. That may sound harsh, but the new process will actually “open the door” to communion again for many divorced and remarried Catholics. Pope Francis tends toward forgiveness and mercy over judgment and condemnation. It is interesting then, to have the Pope’s visit as a background for the Gospel reading for October 4. Coincidence? I think not. We live in a world that is filled with goodness and filled with brokenness. In the Genesis reading for Sunday, we see how utterly perfect human relationship can be. “At last!” Adam shouts; he is alive because she is alive. But in the very next chapter these same companions deny their own responsibility for an act of disobedience by blaming another. And so begins separation from other people, and separation from God. The first section of this Gospel deals with divorce. It actually describes a jousting match between Jesus and the Pharisees; I suspect any topic could have been chosen. As always, they wanted to trap Jesus into saying something unhelpful. Here they ask a question about divorce. A reminder to you that it was just a few chapters back that John the Baptist was beheaded by King Herod who had forced his brother to divorce his wife so Herod could marry her. John had been a bit too outspoken about that mess. The Pharisees were probably hoping Jesus might lose his head over it as well. But, there were no “equal partners” in the divorce of Jesus’ time. Only men could divorce their spouses. If a woman was divorced by her husband, she was essentially stripped of her identity. She, like children (see Reflections from 9-16-15), became a non-person with out status, dignity, and rights. Stricter laws would protect these vulnerable ones. I’m sure that these verses can seem callous and hurtful to those who are divorced. If that is you, please know that Jesus speaks of the life-giving character of relationships. And when relationships cease to give life, Jesus offers forgiveness, mercy, and grace. The text then moves to our other vulnerable group: children. The disciples shooed them away (were they not listening 2 weeks ago?). But Jesus said “Bring ‘em on!” and he blessed them. 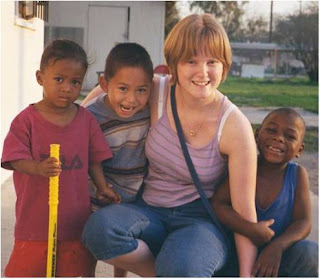 Note: The photo of “vulnerable ones” is from a trip to Central City Mission in San Bernardino, CA made by Lutheran Campus Ministry at the University of Iowa in 2004. The Mission stands in a neighborhood of violence and drugs to proclaim the Kingdom. What does this Gospel teach you about God’s Kingdom? How do you enter? As for marriage, how can the church hold up God’s intentions without hurting those who are divorced? What would you tell those who find themselves in a marriage that doesn’t offer the possibilities of new life? Check out the G.I.F.T. post for this Sunday, October 4, for more ways to reflect on these verses. There are so many broken relationships in our society today, it all begins and ends with understanding God's love.